You’re familiar with the gunfight at the OK Corral in Tombstone Arizona, Wyatt Earp and Doc Holliday, but have you ever heard about the Tombstone Biker Bird? Caesar is a 15 year old Shamrock Macaw parrot who rides to work each day on the shoulder of his owner Paul Randall, also known as the Birdman of Tombstone. Yes, Caesar the Macaw parrot rides a motorcycle. I took a few minutes to find out more about this incredible duo, and local attraction. I first saw the two leaving Tombstone as we walked towards the Ok Corral from Stampede RV Park and did the first ever “double take” of my life. I had to make sure I saw a parrot on the shoulder of this biker as he rode away. I was staring at them on the next road over when the rider waved at me. I was indeed seeing what I thought I was seeing. Later in the day, I found out that the Tombstone biker bird and his owner Paul ran a local business just off the main drag featuring biker patches and sewing called Dream Walkers of Tombstone. Dreamwalkers is owned by bikers, for bikers and is the biker stop in Tombstone. They’re located at 318 Toughnut Street on the corner of Toughnut and 4th, next to where the trolly pick up point is and across the street from the Old Hawg Corral (If you’re in Tombstone and want a great tour, get on the trolly by the way). 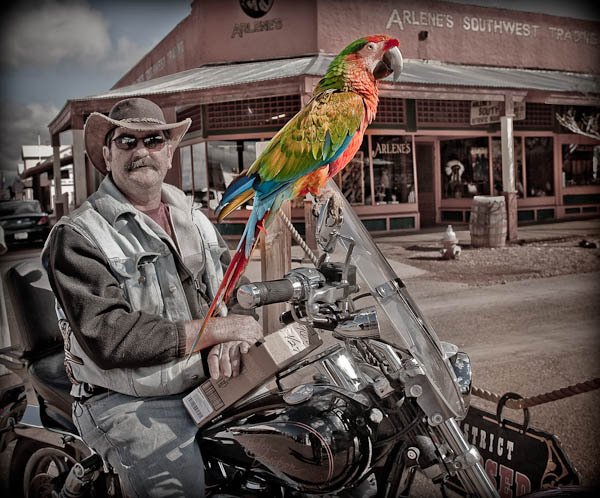 Just as you’d expect to see a stage coach or the gunfight at the OK Corral, you’ll also find that a parrot riding a motorcycle is quite normal here in Tombstone Arizona.